Nacházíte se: Booktook.cz → Odborná literatura → Cizojazyčné → Gynekologie a porodnictví → Obstetrics and Gynecology Board Review Pearls of Wisdom, 4th Ed. 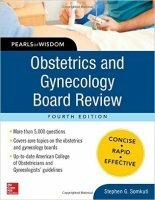 Obstetrics and Gynecology Board Review Pearls of Wisdom, 4th Ed. Maximize your obstetrics and gynecology exam score! This powerful, results-oriented study guide delivers everything you need to improve your knowledge, confidence, and recall. Featuring a rigorous, quick-hit Q&A format consisting of short clinical questions with brief answers, this book is truly your most effective weapon when preparing for the OB/GYN in-service and board exams. The format of Obstetrics and Gynecology Board Review eliminates the guesswork associated with traditional multiple-choice Q&A reviews and reinforces only the answers you need to know. With content following the OB/GYN board exam blueprint, emphasis is placed on the key facts and clinical pearls that are essential for success. This high-yield review is the perfect complement to larger texts, and it delivers the intense, streamlined study you want in the days and weeks before the exam. Features: 5,000+ rapid-fire questions cover all the core competencies in obstetrics and gynecology; expanded coverage of the new technologies used in OB/GYN treatments, including robotics; and the latest in American College of Obstetricians and Gynecologists' guidelines. Get the highest score possible with: Bull's-Eye hits on anesthesiology exam topics - the meaningful and the frequently tested; tools to imprint your memory such as pearls, mnemonics, visual imagery, and other tested learning aids; Rapid-Fire Q&A Presentation that maximizes your study time; and no confusing wrong answers to clutter your memory.